§A Stóðbjôrn(?) and Eysteinn erected the stone in memory of their father Gulli(?). May Christ have mercy(? ), relieve his soul. §B Kjúli(?) carved these runes. His wife was called Ketillaug/Ketillauga. And Véelfr. 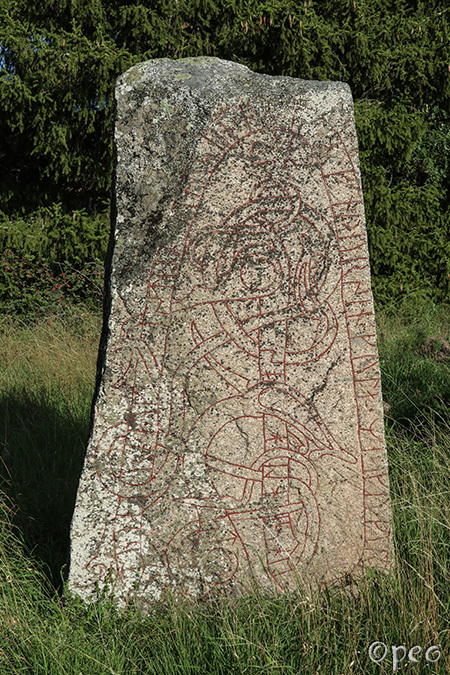 The rune stone is probably standing on its original site. I suppose that an early medieval "road" passed next to it. There's no remains of it now, and the stone is standing solitary on the verge of meadow and a forest. Point at the photo to see the §B-side.